I’m alive! I don’t know how often I’ll realistically be able to post to the blog, but I have a few finishes to share that I hope to at least get posted. It turns out starting a new career is exhausting and overwhelming and a lot has happened over the last few months since moving to Orlando. But I’m slowly starting to get my sea legs and finding pockets of free-ish time. But for now, I wanted to get some of these finishes posted. 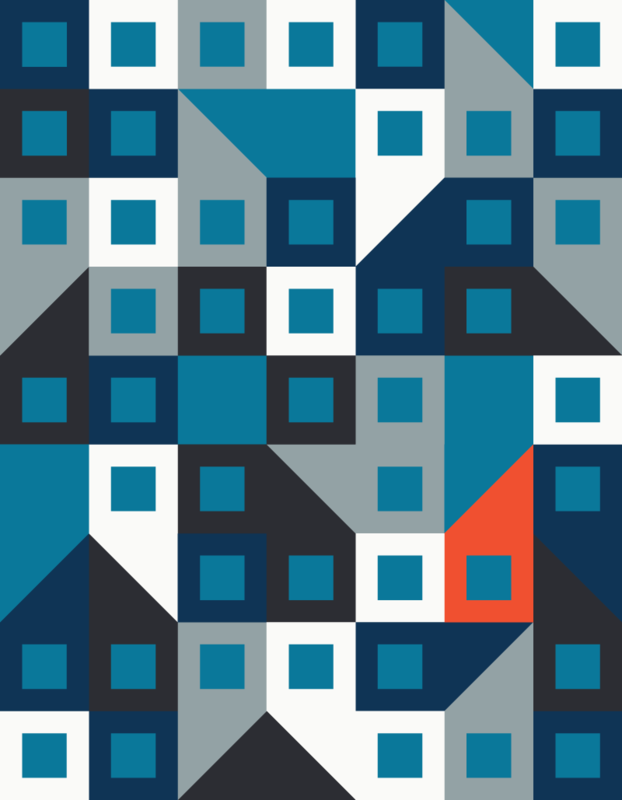 Shortly after QuiltCon 2015, I contacted the MQG and asked if they’d be interested in a Quilt Design A Day (QDAD) special exhibit for QuiltCon 2017. They were excited about the idea, and I brought in Michelle Wilkie @ Factotum of Arts to help coordinate (read: she did all the work). The QDAD format we follow is once a day a photo and palette are posted, and people make their designs using the photo as inspiration and use the palette for their designs. For the exhibit, we decided we’d do a single inspiration image and palette, everyone would design and make their quilts, and we’d have a display of them together to show the range of possibilities from the single image and palette. It’s been a couple years now since I’ve participated in QDAD. After a year of it, I had learned what I wanted to learn and was ready for new experiences. But as the founder, I really felt that I should participate. Although I was going to be terribly embarrassed if my quilt didn’t get in, which added a wee bit of extra pressure I really didn’t need to give myself. So I started designing. I made quite a few designs, using the design techniques I’d played with during my year doing QDAD. But I wasn’t happy with any of them. I did get two to a point where I was tweaking details and figured perhaps that was a sign I should try making them in fabric. I ordered fabric for one of them and I made a mistake in translation of an angle which made all my cuts wrong. While debating whether I should order more fabric and try again, or do the other design, I chatted with my friend Rebecca who was also doing the challenge. When I sat and thought about it, the answer was truly, “neither.” She mentioned it seemed too late in the process to do another design, but I knew I wouldn’t be happy with either. And also I’m maybe a little [lot] stubborn. I spent some time brainstorming what the hangup was, and I tried to really figure out why I was struggling with the design. I realized that I was using my QDAD techniques, which involve picking out shapes or angles and designing around that. These are great for doing quick sketches and when you’re doing a different one every day, you certainly don’t go deep into the inspiration. But I’m in a very different place as a designer 2 years later, and my quilts lately are what I call “story quilts”, which is something I am really drawn to – trying to capture a feeling or story through the design. So I went back to the inspiration image. Looking at the apartment buildings I thought about how I have never been able to feel at home in an apartment. And I thought about how in reality, I haven’t felt at home in a long time. I have moved over 25 times throughout my life, and in the last three years I have lived in 3 different states. There’s an unsettled quality that comes from moving so much – everything starts blending together, but the differences can be really jarring. I wanted to create a quilt about seeking a place to rest in the chaos and trying to find home in the process. That was the emotion I wanted to try to capture with my quilt design. I started out with the simple square in square, mimicking the apartment windows. But it was too static, it didn’t capture that chaos I was going for. And I did love that angle in the original image. At first I tried to keep the angle the same, but realized that the whole point of inspiration is that you can take it wherever you want. So I changed it to a typical HST angle which had the added benefit of bringing in the idea of roof tops. And then the rest of the design just fell out of my head over the course of about 10 minutes. 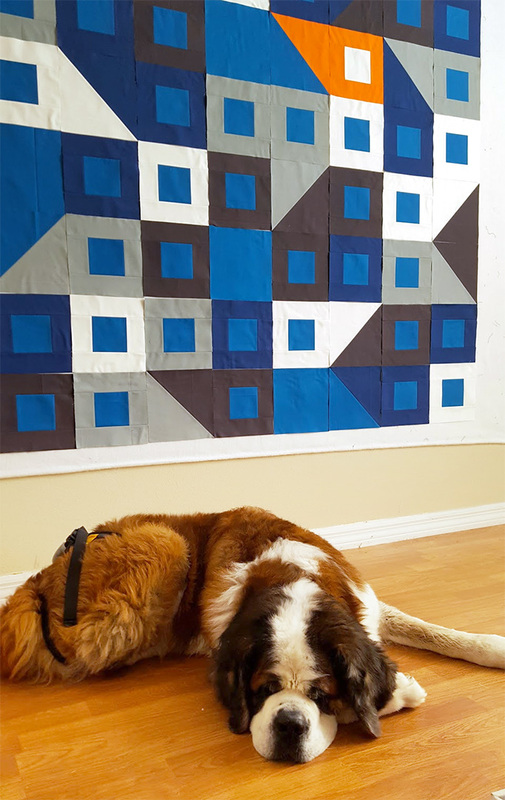 The quilt itself is fairly simple and went together quickly. I did make one change from the design, in which I “turned on the light” at the orange home. For the quilting, I wanted to reinforce the frenetic energy, so I used vertical and angled lines. For the vertical lines, I also spaced them in an uneven pattern to convey the unstable feeling of moving. I was running out of time so I didn’t get a chance to quilt the angles as densely as I might have liked, but overall I think it’s fairly successful. And of course the best of all! My quilt got into the exhibit and the exhibit was fantastic! I took photos of every quilt in the exhibit, and will hopefully get that on the blog in the future to share. This is a great quilt!! I love it!!! It certainly tells a story and the presence of the orange house with the lights on is very suggestive. The quilting is perfectly chosen to accentuate that so often renewed search for stability. You must be very happy with this beautiful creation! Thanks so much, Kitty! I’ve been doing so much improv, it was weird to move back into something so structured. But I was definitely happy with how it came out. 😀 It’s so cool to hear you picked up on many of my design choices! I am so moved by your quilt. The graphic, modern lines are fantastic and the message conveyed can be so personal to each viewer of the quilt. I know it was for me. Congratulations! Beautiful work! Will you be publishing a pattern for it? Very powerful. The strong geometrics. The complementary blues and shot of orange. The sense of home. The story and process. I had never considered using quilting lines of varied width, but will now, I like the effect. Great job. 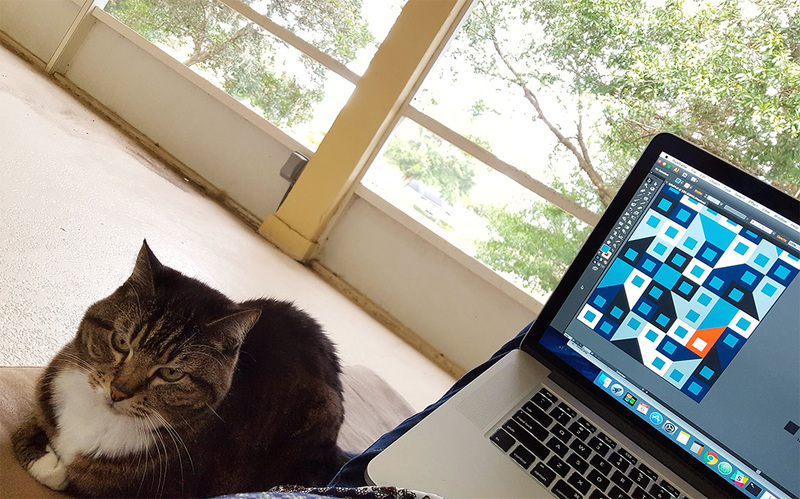 Camille is right, you could publish and sell a pattern; but I suspect you are busy with the next quilt! I saw the varied quilting lines at a show and filed it away as a "I need to try that sometime!" and it seemed like the right time to bring it out. I wonder if more randomness would have been better in this situation, but whatcha gonna do? Oh that’s awesome, thank you! I loved seeing them together, but I am pretty biased, so it’s great to hear an outsider perspective. 😀 It IS hard to find the time. Even 15 minutes seems precious these days. But at the time, I made it one of the highest priorities for the day and it got done somehow. I really appreciate your description of your process here. I am always intrigued by how people create a new design, and this is a terrific quilt. Also encouraging to think your previous years of effort could result in a whole new process. I love the design, colors and movement, but most of all feel the quilt is true to the inspiration and meaningful as a perfect visual representation of your story. I hope you are able to stay in Orlando for a while after all of the moving. I love the pet pics also. Thank you for sharing this and I can’t wait to see the other entries when you post them. 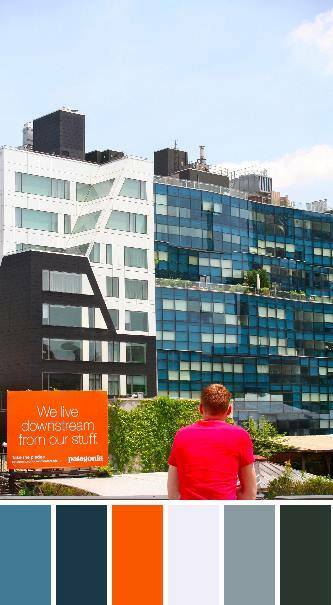 I understand the feeling about an apartment. It is a place to live; that doesn’t always translate into “home”. Maybe I have the reverse problem. Sometimes quilts have toes, sometimes they have fingers, other times both. Yours has a mustache! So often I am stuck in a rut designing, and then one idea (like your using the angles) opens up a flood of ideas. Nice work. Anne – thanks for sharing that story. I did see your quilt at Quiltcon and I do LOVE it. Especially since orange is my favorite color. All kidding aside, the story is beautiful and I think it’s fabulous that you can use your quilting to work through your life or is that vice versus. Anyway – I hope things are going to settle down in your life and that you start to feel at home wherever home may be. Thank you Elaine! I knew you were at QuiltCon, but the one time I got to the vendor section you weren’t at the booth. I was hoping to see you! Maybe next year though? I know what you mean about moving. I think I counted I have moved 38 times in my life. Of course, most of it is in the same state, or even the same town, but still it is unsettling. And I agree, it’s hard to feel “at home” in an apartment. When our kids were young, we lived in a rental home and a home that was divided for 2 different rentals. You are always aware that you have a landlord, especially when they live next door, or come over any time they feel like it without warning. 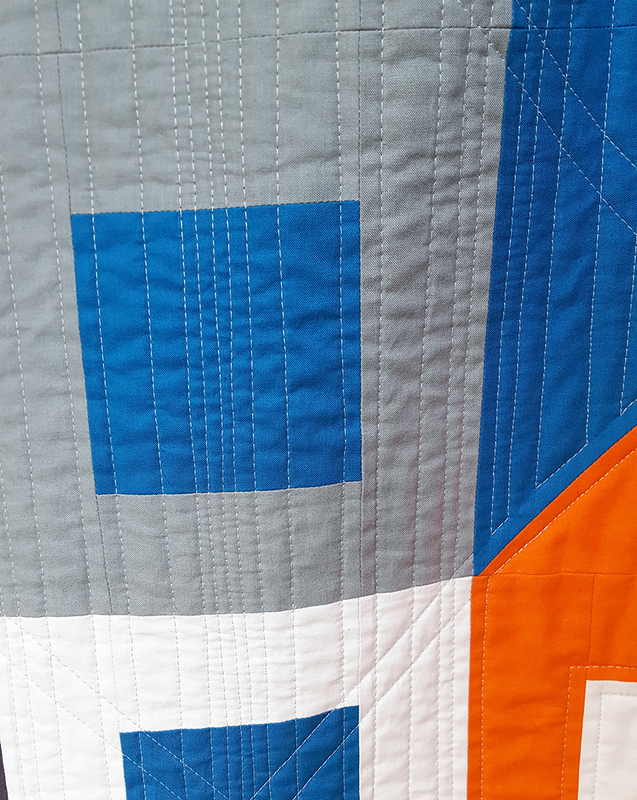 Though orange is my least favorite color usually, I do see it makes a great “light” in your quilt, which is really interesting with the angles and the quilting. I would’ve wanted to add the green and the red in the photo though. 😀 Your story really makes this quilt come alive for me. The design and colorway certainly convey your message. I’m sure you will eventually find a “permanent” home in this life, but now we’ve lived in our home almost 20 years. I’ve wanted to move for about 17. My husband preferred commuting rather than disrupting the kids’ lives with another new school. Years ago, a friend told me that her mother didn’t “keep house,” they just kept moving. LOL. After accumulating so many things from my parents’ home after their passing, I think that might be easier. 😛 I’ve been playing with palette builder again lately. May have to post some of them sometime soon on flickr. I have missed your blog posts. I hope you continue, even in if only monthly or weekly. I see some have abandoned their blog for instagram, which is cool, too. Looking forward to seeing the other quilts at QuiltCon, also. The palette is definitely not my go to colors, but part of the fun of QDAD is working with colors you wouldn’t necessarily pick yourself. The palette was put together by Michelle and I think the photo is hers as well. It was interesting how all the colors were the same, but each quilt was so uniquely different. Pretty cool show! I miss the more long-form discussions that were on flickr and on blogs, though. First of all, I’m glad you are finding a bit of a groove and settling in. I do love the story telling nature of your quilts, and I’m so glad you pushed yourself to think about this design and refine your idea more. Thanks for all the inspiration – for the seed of an idea that became QDAD and continuing to share your process as it continues to evolve. Your introspection quilts were one of the first times I considered doing some storytelling with my quilts! 😀 <3 They were hugely inspirational for me. 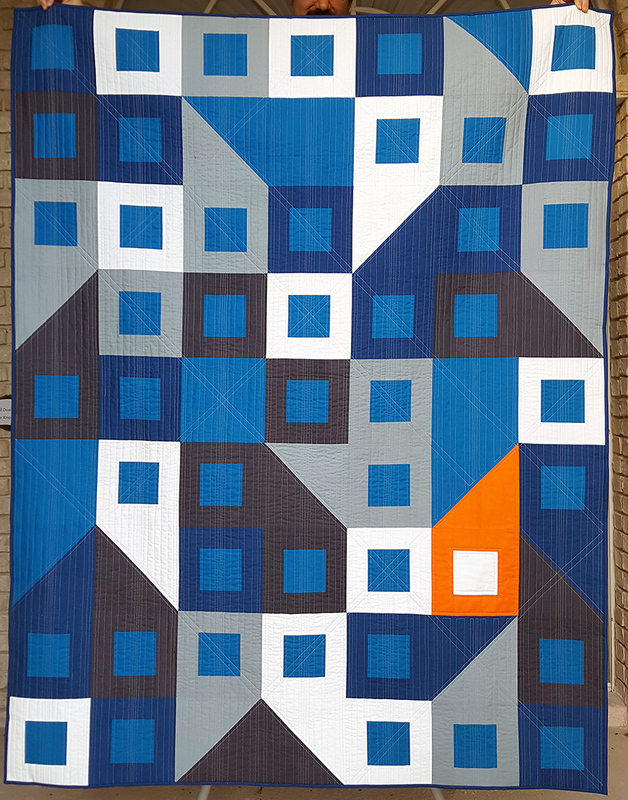 The other push I needed was Chawne Kimber's quilt ("The One for Eric") at QuiltCon last year. Love this, and I’m so glad you shared about it. Inspiring! I think you definitely got your story across with this quilt. I remember when you were doing the QAD and I still have (I think) one particular one you posted that really resonated with me and that I thought I’d like to try to make into a quilt some day. Ohh that’s awesome to hear! If you remember which one, I’d love to know. 🙂 I actually made a webpage ages ago with them all on it, but never shared it. I use it mostly for my own use to quickly search the designs. I enjoyed seeing the QDAD exhibit at QuiltCon! I went back to that section a couple of times admiring the gorgeous quilts. Thank you for your vision of the group and making the exhibit a reality. Your quilt is a beauty and I appreciate you sharing the story and process. I must say we are glad you are now settled in Orlando and hope your moving days are behind you for a while! Anne, I just love seeing this come together. I had never really seen the quilting on it until this post. I love how simple and beautiful the quilting is on it. Michelle spoke at the Greenvile MQG this weekend and we enjoyed hearing more about the QDAD exhibit from QuiltCon and she showed us how to use the Palette Builder, awesome tool!